Chandler Carruth leads the Clang team at Google, building better diagnostics, tools, and more. 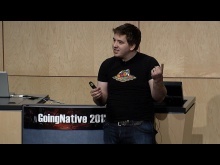 Previously, he worked on several pieces of Google's distributed build system. He makes guest appearances helping to maintain a few core C++ libraries across Google's codebase, and is active in the LLVM and Clang open source communities. He received his M.S. and B.S. in Computer Science from Wake Forest University, but disavows all knowledge of the contents of his Master's thesis. He is regularly found drinking Cherry Coke Zero in the daytime and pontificating over a single malt scotch in the evening.